As Number I of Organization XIII, Xemnas is therefore its creator and leader; as such, he goes under the title of ‘Superior', ruling with his ethereal blades - named Interdiction - of Nothingness. He is the main antagonist behind the scenes, often sending his underlings to carry out his dirty work while he looks after his precious Kingdom Hearts that looms in the night sky of The World That Never Was, feeding it hearts to bring it to full power so he may become one with it. At the beginning of the game he comes across Roxas in the Dark Meridian as an unknown entity, one who knows Roxas' true nature but is not about to reveal it. It is revealed in Kingdom Hearts 358/2 Days that he was the one who scouted Roxas and his talent with the Keyblade; due to events in the game Roxas escapes his grasp before being detained by Riku and taken to DiZ, away from Xemnas' sights prior to the events of Kingdom Hearts II. Later on in Kingdom Hearts II when Sora has reawakened, Xemnas makes himself known with several of his posse in Radiant Garden, the place where Xehanort - Xemnas' human self - lost his heart after an experiment with the heart as an apprentice under the then-king, Ansem the Wise, who Xemnas consequently exiled once he came into being, taking Ansem the Wise's research as his own. After cracking an empty joke to Sora about them possibly being able to be friends once upon a time, Xemnas leaves and spends a great chunk of his time at The Castle That Never Was presiding over Kingdom Hearts' progress while sending his lackeys - notably Saïx, his second-in-command - to get their hands dirty for him. He mainly tasks Saïx with sending more Heartless Sora's way so that the Keyblade Wielder will destroy them and fuel Kingdom Hearts. Xemnas is seen again much later just before the 1000 Heartless battle in Radiant Garden's Great Maw (he went there to access the world's computer system to gain access to the Chamber of Repose), where he appears atop the canyon, at which point his identity as Ansem the Wise's apprentice is learned. After Sora and co. have finished with the Heartless, Xemnas is approached by the King and his cohorts with questions about Kairi's and Riku's whereabouts. Xemnas tells them that the King knows - another riddle - before he returns back to his castle. Xemnas remains evermore a mysterious entity until Sora and friends reach his headquarters at The World That Never Was. Here, Xemnas is presiding over the completion of Kingdom Hearts as Xigbar, Luxord and Saïx attempt to take care of Sora before he can reach Xemnas and ultimately destroy Xemnas. When his three underlings fail, Xemnas goes to visit Ansem the Wise with his machine at Naught's Approach, having been alerted to the beam that was attempting to encode his Kingdom Hearts. After mocking his former master, Xemnas reveals that his goal is to create a world, one heart at a time that Ansem the Wise famously dubs as an "empire of ignorance". The machine explodes shortly after, during which Xemnas takes the opportunity to escape back to the Altar to see that Kingdom Hearts has been left with a gaping hole and unfinished. Though incomplete, Xemnas challenges Sora one-on-one and when he is defeated he asks Kingdom Hearts to join with him. After it obliges he is taken inside it and in there he presumably creates the Dark City-esque atmosphere with towering buildings and a mechanical dragon. He is soon followed by Sora and his friends but after Xemnas throws a building at them, Sora and Riku are left to proceed through Xemnas' barrage of attacks and forms. After a series of battles with the mechanical dragon and Xemnas in a kingly knight form, Xemnas falls down but he is not finished; his mechanical dragon breaks free and after it is defeated, Xemnas once again takes upon his knight form. Once he is bested yet again in this form, he turns to his final form and does battle with Sora and Riku before he finally meets his end at the end of their Keyblades. 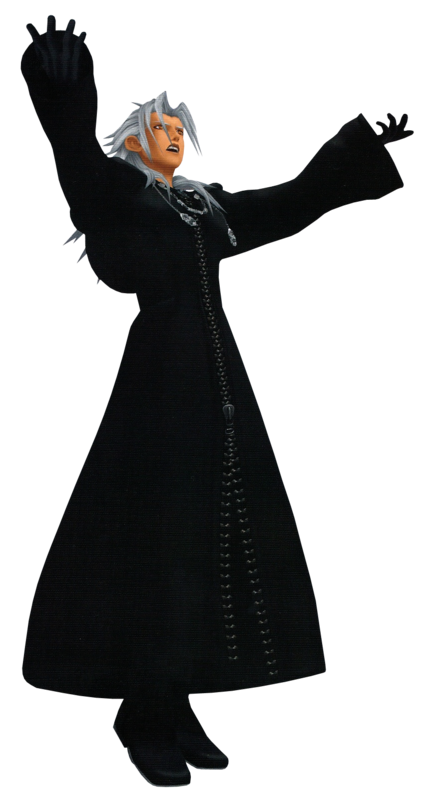 Nobody of Xehanort and the absolute leader of Organization XIII (known to all as "the Superior"), Xemnas can be considered the "man behind the curtain" for most of the game's events. Shortly prior to the end of the first Kingdom Hearts, he confronted Sora, Donald, and Goofy in Hollow Bastion, harvesting memories from the Keybearer as they fought. Once he was satisfied with both Sora's strength and his memories, Xemnas promptly fled the scene, fading away with only a few cryptic words: "In any case, the time when we can meet again will doubtlessly come soon…"
Later, roughly around the time of Roxas' entry into the Organization, Sora's stolen memories were implanted inside a blank Replica doll, a part of the late Vexen's chief research. With hope, the Replica's stolen memories from Sora would allow it to wield the Keyblade, giving Xemnas his own Keybearer, one that was completely loyal to him alone. With such a power at his beck and call, it would only be a mere matter of time before the power of Kingdom Hearts belonged to him as well. However, the Replica, later called Xion, soon began developing more of an individual identity as it unintentionally intercepted more of Sora's memories - ones that should have belonged to Roxas. It then occurred to Xemnas that two beings both derived from one person couldn't possibly coexist, as one would eventually absorb the other. From then on, all of Roxas and Xion's missions were set up to allow Xion even more power, so that she would absorb Roxas, become complete, and prevent Sora from ever waking. At the same time, though, the flood of memories caused Xion to be unstable, causing her to attempt an escape on multiple occasions. When Xion was recovered the final time, Xemnas was firm on taking no more chances with his Keybearer; using devices planted in each of the worlds Sora visited, he directed all of Sora's free memories into her, leaving only Roxas and Sora himself as the final pieces of the Keyblade wielder. Now that his puppet Keybearer was nearly perfected, Xemnas sent her out to finalize the process and assimilate Roxas into herself. From then on, he would have not only his own personal Keyblade wielder, but eventually an entire army of replicated Soras to command…Or so he believed. When Xion failed her task and was absorbed into Roxas, he immediately sent forth his agents to retrieve him, only to find that DiZ had gotten to him first. But Xemnas would not relent; his minions would track Roxas down eventually, beginning the chain of events that would lead into Kingdom Hearts II. When caught in the field of battle, the Superior remains as aloof and afloat as in other settings, levitating off the ground as opposed to walking or running. In terms of weaponry, he makes use of Nothingness in its purest form through his light saber-reminiscent Ethereal Blades, able to be summoned and dismissed at will, which he puts to work in broad, sweeping strokes and sprays of laser fire. However, while both are equally impressing-seeming, only the latter truly inflicts substantial amounts of damage to enemies. Xemnas' most prominent source of strength in combat is magic--which he is able to utilize quite well. The Superior's Limit Break, All-Vanity, unleashes a storm of Nothingness energy that surrounds him in circular aura, inflicting damage to adjacent enemies. He then continues to extend the attack into twin beams of energy that sweep across the battlefield in a wide radius around him, obliterating any surviving foes. 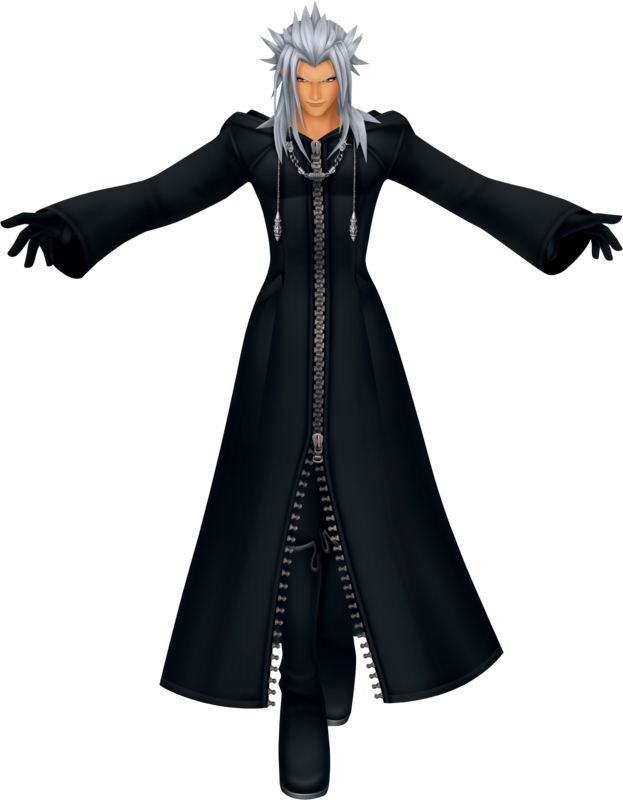 The Nobody of Apprentice Xehanort, Xemnas was the former leader of Organization XIII, ranked number I. He has complete control over the powers of Nothing, and wields dual Ethereal Blades, blazing red and humming with energy. His goal was to utilize the hearts Sora was releasing whenever he defeated a Heartless and gather them together to create his very own Kingdom Hearts, with which to grant him powers beyond any have ever seen. The rest of the Organization seems to have been under the assumption that Kingdom Hearts would give them new hearts to become whole again, but that doesn't seem to be the case. Xemnas appeared to Sora alongside the mysterious silver-haired man in Prankster's Paradise, taunting Sora and mocking Pinocchio as a hollow puppet who's managed to grow a heart. Sora doesn't understand how he can criticize when it's completely possible for them to grow hearts as well, just like Pinocchio, but Xemnas just laughed at how the young wielder alienates Nobodies when they are not so different from himself. He visited Sora once more in The Grid, explaining that memories and hearts are tightly linked together. Memories create feelings, and although that is the case in the world of the living, it's not necessarily the same in the digital realm. You can have as much information as your memory can contain, but no feelings can ever be born from them, and thus, no heart. He stated that this world was the original of Space Paranoids; Ansem the Wise had discovered it long ago and made a copy to serve his own computer. And in this world, things like memories can be easily manipulated to serve the needs of the master. Although Sora was already distraught over Rinzler, Xemnas mocks him, or Tron rather, as being an entity of The Grid, he must obey the laws the world follows and thus, has no reason to remember Sora. But in fact, is it only just Tron? Again, is Sora really all that different? Perhaps his memories, dreams, data, even his very heart are just duplicates of another? The boy stubborn insisted otherwise, but to be honest, how can he really be sure? By the time the two had met again, Sora had dove deep into the depths of his dreams, although he didn't realize it. Xemnas took advantage of that fact and taunted him, revealing the knowledge that he had been entirely aware that hearts can be reborn and had chosen to hide it from the other members of the Organization. The reason for this? The 13 members of Organization XIII, empty shells left behind when original beings lost their hearts to darkness; by connecting them to Kingdom Hearts, Xemnas and Xehanort would be able to fill them with the exact matter, the same heart and mind, all in order to turn every single one of them into Xehanort. Although that plan had failed, they learned enough to continue onwards on another path. Although Sora passionately disagreed and fought to prove that it's the connections with other people that made him strong, not even he could come out victorious this time. He dove too far into his dreams, and could not return from the abyss. With him filling up the remaining slot among the seekers of darkness, there was nothing left to do but wait. However, no plans could go that accordingly, no matter how far in advance Xehanort had planned it. Riku and Mickey burst into the Round Room to rescue Sora, but they were rendered useless by Ansem Seeker of Darkness and Xemnas. When it seemed all hope was lost, Xemnas was astonished to find Lea saving Sora from becoming their final vessel. Now that their time had run out, the 12 Xehanorts who had gathered together had no choice to return to their origins, at least until next time. The Leader of Organization XIII. He recruited Nobodies under the guise that they wlll collect hearts from the Heartless to go into their very own Kingdom Hearts which would grant them their own hearts. Only a select few were granted the privilege of knowing the true goal behind Organization XIII. He fell to Sora and Riku after the other members of Organization XIII were slain. 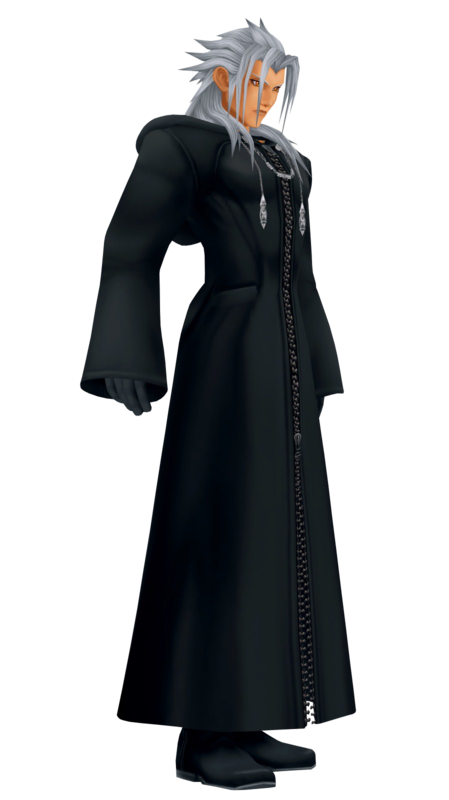 He is a member of Master Xehanort's Organization XIII, which seeks to collect vessels for Xehanort to give a piece of his heart to in order to create thirteen Seekers of Darkness. He appears in Twilight Town alongside his Heartless, Ansem Soul of Darkness, to taunt Sora over to the Darkness.